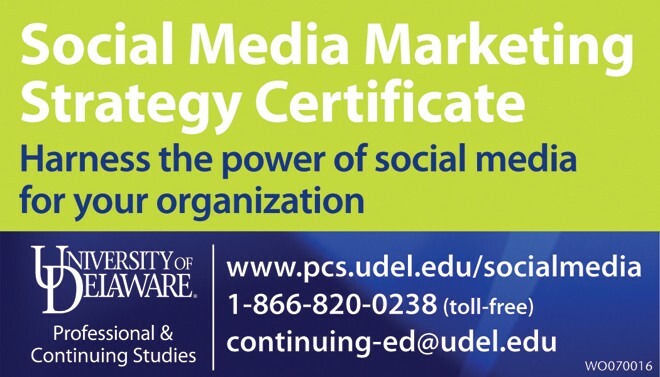 Meredith Chapman is one of the instructors in the University of Delaware’s Social Media Marketing Strategy Certificate program and is asked often about how businesses can best improve their strategies and reach more customers. The program, which is a 2016 recipient of a National Outstanding Program Award from the University Professional and Continuing Education Association, helps newcomers learn how to make use of social media platforms and helps experienced practitioners learn new techniques. If a business is trying to reach 17-to-25-year olds, it must use Snapchat. Young parents age 35 to 50 spend their time on Facebook. You need to pick the media where the target audience is. People increasingly spend time on their smart phones and they want to see pictures and videos. Tell visual stories to capture people’s attention. According to program instructor Holly Norton, any content needs to have the “three Rs” to resonate: It has to be real, relevant and repeatable. It has to be something that is tangible, here and now and something that people want to share. It’s great for a business to share its story, but it is better for others to recommend the product or service. That way, they can create experiences that others want to share. customers and turn that into social media strategies that help shape big decisions. University of Delaware’s Division of Professional and Continuing Studies offers a variety of professional development programs. Courses are offered online or in the classroom and are all designed to enhance students’ capabilities and to help them become more successful in the ma rketplace. For information, visit www.pcs.udel.edu or call 302-831-7600.